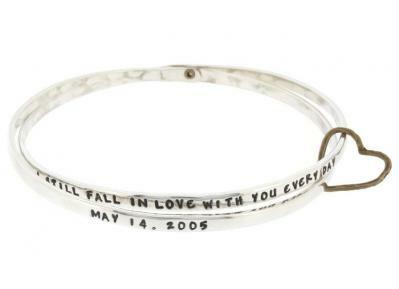 "Personalized Love Bracelet Silver, Stacking Bangle Bracelet"
A simple custom bracelet that is a daily reminder your love. 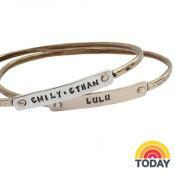 Wear one or create a stackable bracelet set with words and phrases that bring you thoughts of your love. 2 bracelets can be intertwined. Let her know how you feel about her. 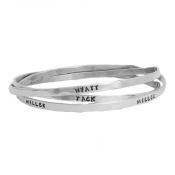 This stackable bangle bracelet can be stamped with words or a phrase that will be a daily affirmation of your love for her. 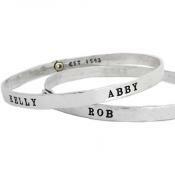 Each bangle can be stamped up to seven times when a phrase is used. We can allow for 12 characters/spaces per stamp. The stamps will be equally spaced around the custom bracelet. If you want to do a phrase, we can space the stamps closer together - just let us know in the comments. Ideas: Follow your heart, FAITH HOPE LOVE, Always in my ♥, LIVE LAUGH LOVE, Live every moment, Laugh every day, Love beyond words. Bangle is approx 3mm wide. All silver is sterling and rivet is brass. This is a bangle bracelet and does not have a clasp, it slides over your hand and onto your wrist. 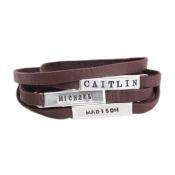 We are unable to change the size of the bangles once they are ordered so please be sure to order the correct size. We STRONGLY suggest that you view the video below (in the tab belpw) and print out the bracelet sizing guide to help you determine your size. Please make sure you print the page at 100% (do not scale page or the measurement will be incorrect). Sorry ~ we cannot stamp on the inside of the bands. We only use sterling silver,14K gold, gold vermeil, gold filled and bronze in our products.